Americana is where you belong! Featuring Waves Indoor Waterpark, 200 guest rooms/suites, Senses full service luxury spa, restaurants and comedy club our staff dedicated to providing the best in hospitality. The Americana Hotel in Niagara Falls, Canada offers the only Niagara waterpark with a retractable roof. This hotel offers an ideal getaway for any traveler type, whether it be business, family, or pleasure. With over 20,000 sq. ft of meeting/conference space, the Americana Conference Centre and Spa can cater to your every need. 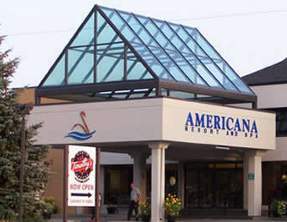 The Americana is a unique Niagara Falls Hotel offering the ultimate family vacation retreat and corporate conference centre. Some of the treasury of amenities you will find at the Americana include Waves Indoor Water Park, the premier water park in Niagara Falls featuring a retractable roof, slides and more; Senses Spa & Boutique, a full-service spa for those who want to get away and relax. Also available at this hotel are in house dining at Jack Tanner’s Grillhouse, free wireless Internet hot spots and over 21,000 square feet of meeting, banquet or wedding space. All rooms at the Americana come equipped with a mini fridge, coffee maker,microwave, hair dryer, internet access, iron and ironing board. Situated within the hotel is the House of Comedy featuring the best stand-up comedy entertainment the Niagara Region has to offer. Parking is available on site for all guests of The Americana Conference Resort & Spa. The 25,000 square foot indoor water park with a retractable roof for year-round fun features: a beach entry wave pool, tube slides, body slides, kiddy pool interactive play structure, whirlpools, lounge areas and food & bar services. Treat yourself to a day at the Senses Spa & Boutique, a wonderful place to relax and rejuvenate your body and soul. Jack Tanner’s Grillhouse & Beverage Co.
“Jack Tanner’s Grillhouse & Beverage Company” is a casual traveling themed restaurant, which offers a friendly and fun atmosphere with a wide variety on the menu and a great bar for after dinner gatherings it is the perfect choice. Jack Tanner’s is open for breakfast, lunch and dinner. The Americana Conference Resort and Spa offers over 20,000 square feet of meeting and function space including 15 Corporate and Parlour Suites that are ideally suited for groups of 5 to 125. For larger groups the Grande Ballroom can accommodate up to 1000 delegates sets the standard in meeting facilities with its elegant décor.